This All In One State and Federal Labor Law poster provides everything you need to be legally compliant and avoid fines. all across the United States trust us to keep them in compilance with State, Federal and OSHA regulations. As our client, we will ensure that you are in compliance and always informed of regular occuring changes and updates. What are labor law posters and who is required to display them? Labor law posters are the mandated state and federal employment law notices that employers with at least one employee or more are required to conspicuously post in an area frequented by all employees. Failure to display the correct state and federal employment law notices can result in penalties, fines and lawsuits. Are my labor law posters current? Am I in compliance? You can check your labor law poster compliance by visiting our Poster Compliance Check page — click here. With our Poster Compliance Check, you can view the changes to your poster by state or verify if your current poster is compliant or non-compliant. If your state and federal labor law posters do not include the latest revisions, then you may be out of compliance and your posters must be updated. 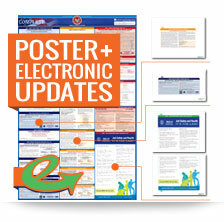 All labor law posters purchased from LaborLawCenter™ include the revision date for each employment law on the bottom right hand corner of the individual notice. Where do I display the labor law posters for employees? Labor law posters should be "conspicuously" displayed in area that is frequented by all employees on a regular basis. Examples of such locations include: designated bulletin boards in the break room, above time clocks, in the employee lounge, in a cafeteria or a lunch room. How do I know that the LaborLawCenter™ posters I purchase are compliant? 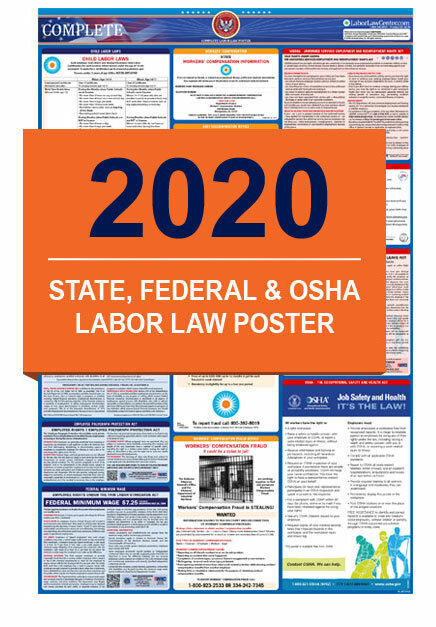 Any labor law poster you purchase from LaborLawCenter™ is guaranteed to be compliant with current state and federal employment laws at the time of purchase. Should you ever receive an out-of-date poster from us, we will ship you a brand new one free of charge and refund your purchase. Whenever a labor law update is detected, the posters are immediately placed on hold and not shipped until the change is completed and classified as mandatory or non-mandatory. You will be notified if your poster is on hold for an update and then once it ships. This guarantees that you always receive compliant labor law posters from LaborLawCenter™. Learn more about our 365-Day Satisfaction Guarantee. "Your labor law posters are exceptional. I never have to worry that something is missing"
"The notifications of legal changes that require poster updates are incredibly helpful!" "I think you are the only ones that have the Labor Law posters all in one and that is what we are looking for .Thank you!" 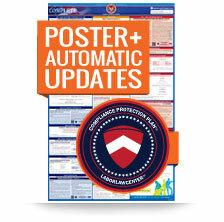 Get added protection to your state & federal all in one labor law poster with compliance service. Get the online printable version of the all in one state & federal poster and receive added protection with compliance service. We'll automatically e-mail you new posters you can print and post as mandatory laws changes. 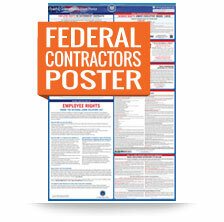 If you are a Federal Contractor or subcontractor,get the Federal Contractors Edition poster to cover all mandatory posting requirements.